Douglas Adams had something against digital watches, always criticizing the ape descendants for thinking they were neat. Well, I have to admit I rather like them. As a 8-year old, I spent the better part of a year saving up for my first Casio. However, at some point in the 90s, they seem to have goon out of fashion. Which is a shame, because there are some really nice geeky looking watches around now. 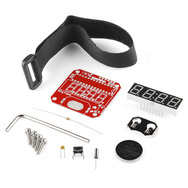 Take these from Sparkfun, for example: The “Solder : Time Watch Kit” to the left is, as the name suggests, a solder kit you put together yourself, to create a fun looking digital watch. Complete with resistors and ICs on display, which is a PIC microcontroller. To the left is the Arudino (ATMega328) based Sparkfun version; “BigTime Watch Kit“. Again you have to solder yourselves, but it is intended as a beginner’s kit, so everything are nice big through-hole components, which there are only a few of. 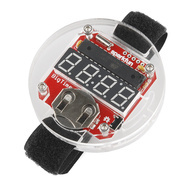 However, if DIY watches isn’t your cup of tea, you can always go for ThinkGeek’s selection. 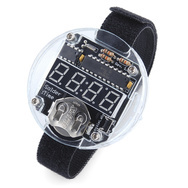 Here there is a lot of good looking geekery to choose from, including a DIP-switch controlled watch, a binary watch, or if you want to go simple maybe a sundial ring (possibly for the next steam punk gathering).